Trucking – Willowvale Farms, Inc.
At Willowvale Farms, we take pride in our excellent customer service and satisfaction. While we primarily service the greater Ohio region, we are licensed to haul across the United States. 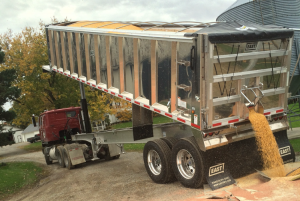 Using our nine semi trucks and dump trailers, we are able to haul white and blue limestone, sand, gravel, salt, cinders, grain products, asphalt grindings and fertilizer. With our flatbed trailers, we are able to haul lumber, shingles, cubed/crushed cars, palletized sand, crane falloff, and roofing tiles. Specialized flatbed quotes are available upon request. For more information about what we haul, please visit our “What We Haul” page. Call us today for pricing and rate requests!